When we think of alternative energy, we usually think of the big players: solar, wind, geothermal, and the like. But there are some alternative energy sources that we rarely consider. Dutch designer Teresa van Dongen explores one of these alternatives in her bioluminescent lamp called Ambio. 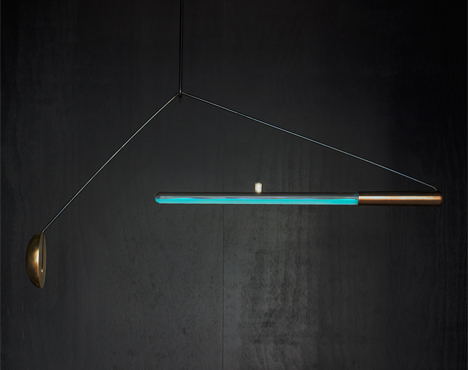 Ambio consists of a glass tube half-filled with an “artificial seawater medium,” counterbalanced by two brass weights. The seawater contains a photobacterium species harvested by taking a scraping from the skin of octopi found at a fish market. The tube is capped off with thick wool that allows oxygen to enter the chamber. When the bacteria are agitated and provided with oxygen, they glow an otherworldly blue color. 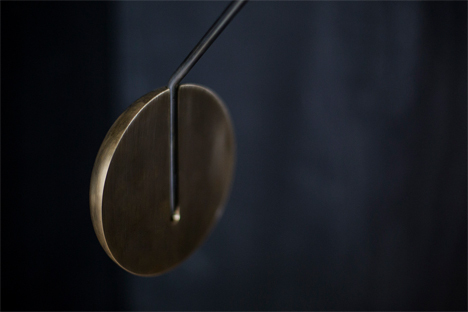 By gently nudging one of the brass weights, the tube begins to gently sway, waking up the glowing bacteria inside. 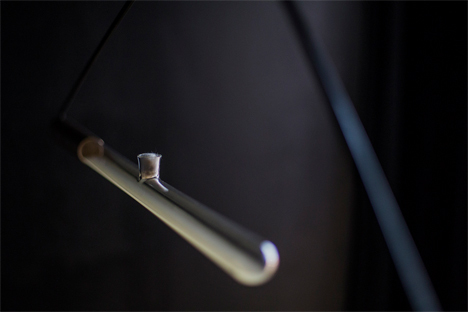 For a short time, the lamp provides a perfectly electricity-free light source. The project is compelling and completely beautiful, but there are problems. The bacteria tend to either run out of food or overpopulate the container fairly quickly, putting an end to the display within about two days. The students from TU Delft who helped van Dongen work on the lamp are currently working on prolonging the lifespan of the bacteria so the living lamp can survive longer. See more in Earth & Nature or under Science. October, 2014.